In High School I really enjoyed Geography and my Grade 11 Geography teacher inspired my love for the subject. In High School I really enjoyed Geography and Mr. Cuvelier, my Grade 11 Geography teacher at Cole Harbour High (circa 1992) was a great teacher and inspired my love for the subject. When I went to Saint Mary’s University I was unsure what I would major in. During my first year I knew very quickly that Geography was what I wanted to major in. Saint Mary’s Geography Department was housed in a separate building on campus and it felt like a perfect fit. The SMU Geography Society took a field trip to a COGS open house and once again I knew I wanted to attend COGS and gain some hands on skills after I graduated. I attended COGS right after graduating from University and enjoyed the year so much. It was very difficult, lots of late nights studying and working at the school but it all paid off on Graduation day! Three weeks after graduation I was so fortunate to find my first job in the field. Remote Sensing at its finest – I was working for a company who collected Hyperspectral imagery and Digital Aerial Photography. It was a small company, but I was doing image enhancement, georeferencing, orthorectifying, mosaicing and classifying imagery from all over the world. My dream job! I worked for that employer for 8.5 years and learned so much. My next employer was the Province of Nova Scotia. I was hired at the Nova Scotia Geomatics Centre into the Topographic Mapping team and started doing quality control on orthophotos. I then moved onto an exciting project mapping Municipal, County and Provincial boundaries that resulted in a lot of research and working with surveyors with local knowledge. I was then transferred to the Civic Addressing team and this is when the magic of Geomatics really hit me. Within the civic addressing group you have a team of geomatics professionals working with civic address points, all the roads in the province, and the community boundaries every day in an effort to maintain a province wide database of this information for so many uses. The primary use is emergency services and it feels so satisfying to arrive at work each day knowing that you are part of a team helping to ensure the right data is being used by ambulances and fire dispatch so that a person can be accurately located when they call 911. Recently I have become the Manager of Geographic Data here at the Nova Scotia Geomatics Centre and this role keeps you on your toes! This role involves so much diversity – HR, oversight on the maintenance of our core geographic datasets such as civic addressing and topographic mapping, OH&S, Budget management, Hiring, and Procurement of services from private consulting firms. One of the greatest perks of this job is seeing our team work on geomatics projects and datasets that test and stretch their technical skills. We regularly see satisfied clients using our products and there is nothing better than that. Most people can find a job, but to turn that job into a lifelong career is something we all strive for. 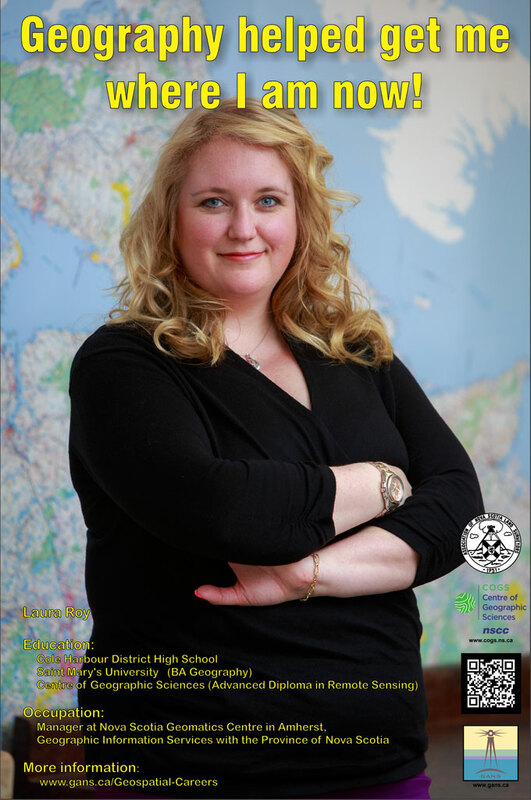 I consider myself very fortunate to have found a career and it all started in a High School Geography class at Cole Harbour High.